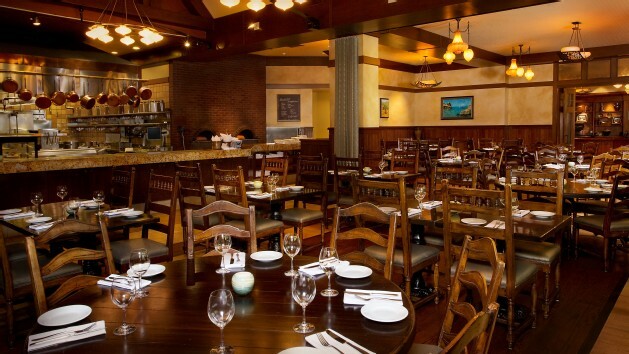 UPDATE: Kouzzina by Cat Cora closed in 2014. 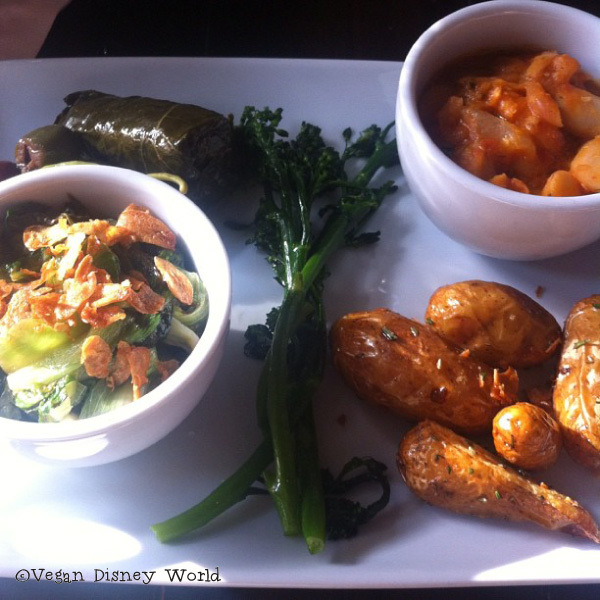 First things first, if you’re not going to Disney World before September 30 2014 then you’re going to miss out on one of our favorite dining spots. Unfortunately Kouzzina by Cat Cora on the BoardWalk will be closing this fall. Kouzzina is a Greek-inspired restaurant opened by Iron Chef Cat Cora. It is along the BoardWalk which is just a short walk from World Showcase in Epcot. It is a table service restaurant that is open for breakfast and dinner. Although it looks to be on the fancier side, the attire is still casual. The theming of Kouzzina is that of an old greek farm house. The highlight of this restaurant is an open kitchen where you can see your cooks create your food. Many people complain of how loud Kouzzina’s can be, however if you’re lucky you can get a seat in the back room where there are only a few tables and the sound does not carry as much. Our quiet table in the back room. After you have been seated and talked to your server, you will be presented with a spread of olive oils, olives and bread. This comes at no extra charge. Kouzinna offers a large drink selection featuring high-end wines and beers. 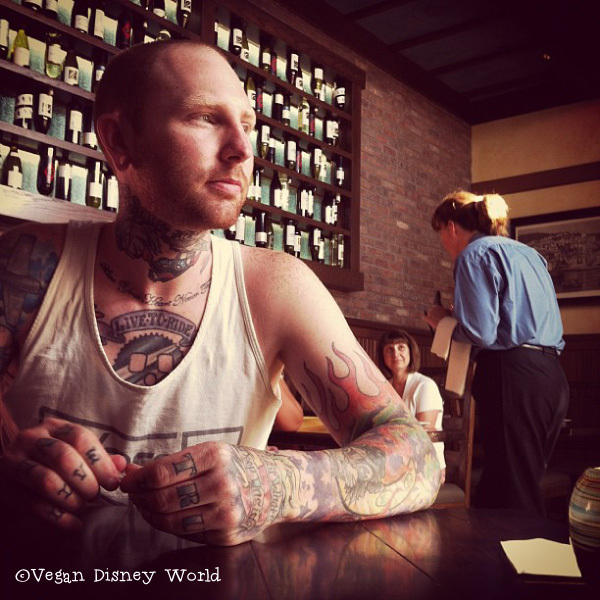 When you go here as a vegan you will get a chance to talk to a chef. The first time we went here, May 2012, we were given two large plates that were basically samplers. We were both given generally the same thing with minor differences. I received two stuffed grape leaves, oven-baked gigantes beans, garlic rosemary potatoes, orzo with veggies and fresh greens. This was my favorite meal of our trip, everything tasted so fresh and not full of oil like most of the restaurants on property. The beans were in a creamy tomato sauce and were my favorite new dish on the plate. 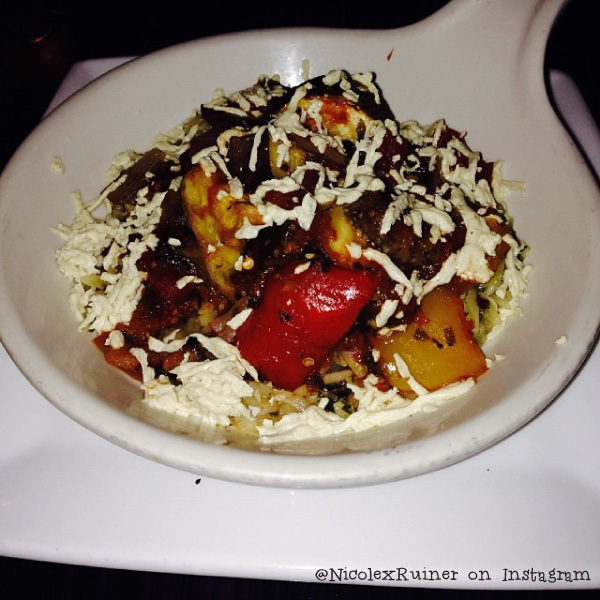 I will go more into the orzo dish later in this post. 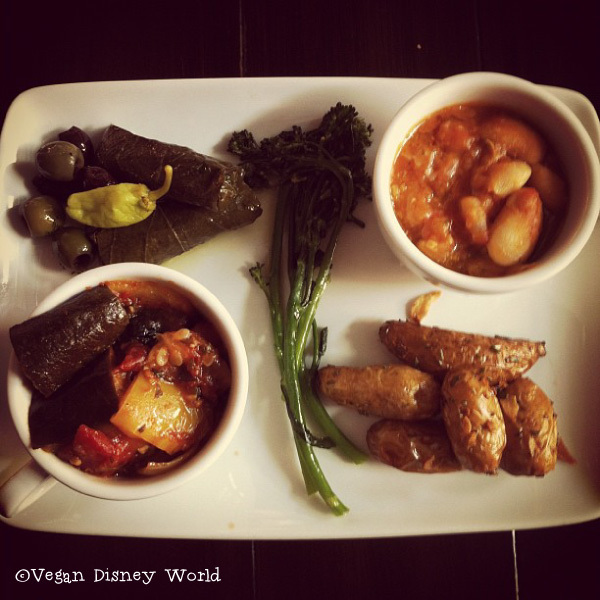 Similar to mine, Corey was also given grape leaves, potatoes, greens and oven-baked gigantes beans. Instead of the orzo he was given what we believe to be was sautéed farmhouse greens. We think the greens in it was escarole and it was absolutely fantastic. When we went last trip, October 2013, instead of both receiving the sample plate Corey received a vegan version of the Birami(Oven-roasted Vegetables – with Oregano and Greek Cheese served with Herbed Orzo.) However when we received it there was no vegan cheese on it. This dish had various roasted vegetables, ours featured eggplant and zucchini, and a tomato sauce. I would definitely request this again and the sampler as well. When we went in October of 2013 we were on the meal plan, which means we get a dessert as well. We tried to bargain with our server to give us an appetizer instead because we were sick of eating fruit or ice cream for dessert and would rather have a hummus app. She wasn’t willing to do a swap with us, so instead we were given a vegan version of Loukoumades (freshly made Greek doughnuts drizzled with warm honey) which means there was no honey. Instead they gave us the doughnuts with a powder sugar on them and they were incredibly dry. We didn’t take a picture of this item. If you are on the meal plan and can not bargain an app instead of dessert I suggest just getting fruit or ice cream. Yes! But only once because it will be closing on September 30 2014. Both meals we have had here were delicious.